Dimter, a member of the WEINIG Group since 1993, offers optimizing crosscut saws that let you increase your yield from each piece of wood, minimize your waste, and produce wood that is strong and defect-free. Like Weinig moulders and grinders, the precision machinery produced by Dimter requires precision tooling for ultimate performance. 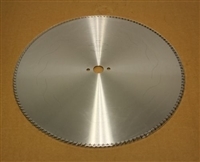 Dimter saw blades are designed specifically to provide maximum performance quality for your crosscut saw. Blades are available from stock; simply select the one that fits your production requirements. Note that larger-diameter blades will not fit all crosscut saw models.